I reported recently that I had to reinstall the Haiku Alpha2 on my Dell E520. While practically everything went according to plan, I later found that I couldn't get any sound (playing .mp3's) out of either VLC 0.8.6 or the native Media Player. And this was despite following exactly the procedure that had worked for me just a few weeks ago. This basically involved installing the oss driver from Haikuware and disabling not just the hda audio driver in /boot/system/add-ons/kernel/drivers/bin/ but also the auich driver in the same location. 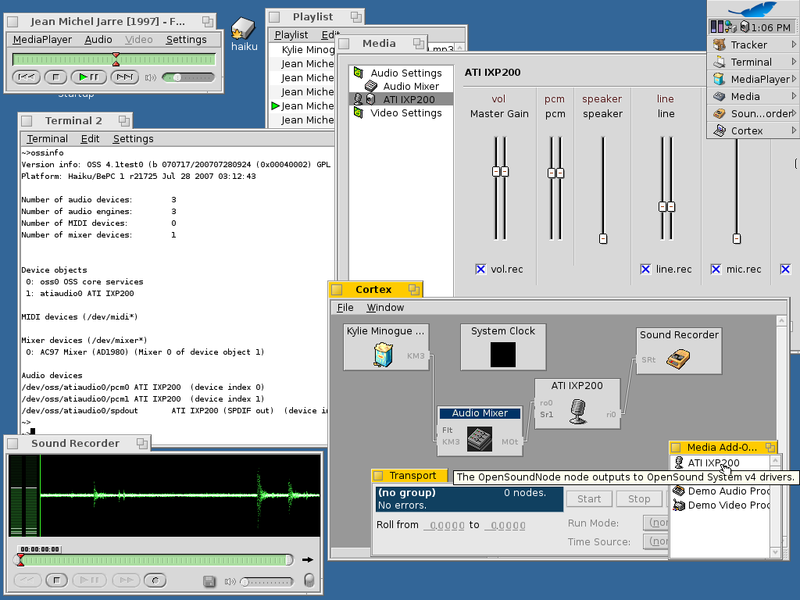 I scrambled around for a long time seeking an answer and did a lot of things including " but after I remove /boot/home/config/add-ons/media/opensound.media_addon again reboot, I Run mediaplayer with *.mp3 and sound is amazing!" which I found in comments to this bug ticket. However, it didn't work for me. Note that osstest worked perfectly for me but ossplay when run without "options" did not as it complained of /dev/dsp being missing. But, still no media players worked. Then I posted to the 4Front-OSS forums and launched this thread. 2. That Haiku has a very extensive Media Preferences section which, in my case at least, has many options for muting and adjusting volumes (see this screenshot). Anyway, after opening and closing the Media Preferences a few times and finding nothing that seemed out of place. I tried a .wav file in VLC and, guess what, this time it worked. Next I tried an .mp3 and this worked perfectly too. Problems solved but I really just don't know why. Glad to have the sound but very disappointed at the inconclusive end to an extensive combat.